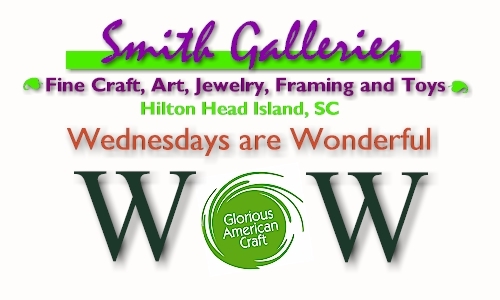 Wednesdays are wonderful at Smith Galleries. With every purchase on Wednesdays, you get to “spin and win” our famous Wednesdays are Wonderful wheel and receive an interesting gift. Smith Galleries is a celebration of excellence in American made fine craft, artisan jewelry, fine art and creative toys for children. The gallery also specializes in custom picture framing. The gallery is located in the J building on the second level above the SubWay. Gallery hours are 10 – 6 Monday through Saturday.